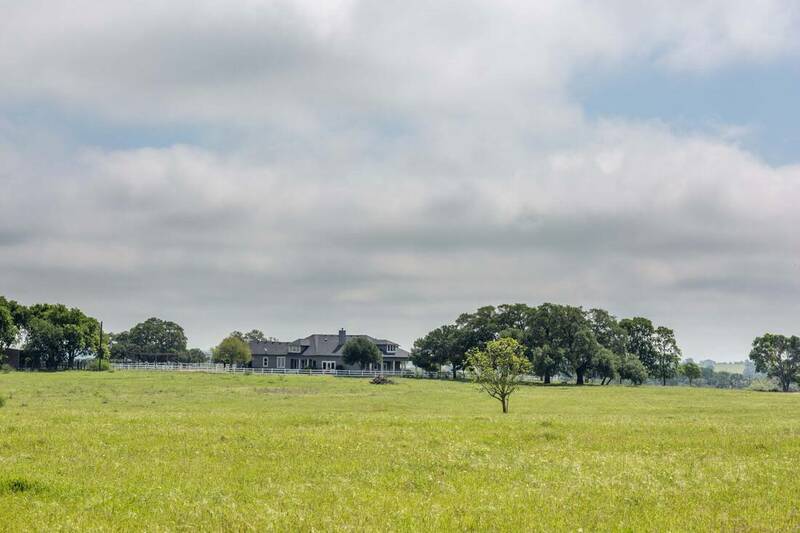 The C5 Ranch is located in northern Lavaca County, an area known for its rolling pastures, majestic live oaks, and deep-rooted German heritage. As you enter the quiet drive of the C5 Ranch you are greeted by mature, native pecan trees that line the wet weather creeks edge. Just past the creek bottom, the private drive opens up into rolling, terraced pastures where you will find the renovated farm house sitting on the highest hill. The home offers large porches in the front and back- great areas to take in the 360 degree views. The C5 Ranch is located 1 hour and 20 minutes from the Grand Parkway, and 1 hour and 30 minutes from both Austin and San Antonio. The home sits on the highest hill on the property, which is about 380 above sea level. The topo has a gradual relief down towards the creek bottom, which is about 330 above sea level. Several of the pastures were terraced back when this area was actively farmed. Wildlife: The wildlife species that can be found on the ranch include whitetail deer, turkey, dove, and other varmints. The two ponds on the property have been stocked with fish and have provided hours of entertainment for kids and adults. Next to several sprawling live oaks on the hill sits a beautiful two-story country home. The original structure was built in 1925 and then renovated by the previous owners in 1996. In 2007, the home was tastefully added on to; the home now consists of 4 bedrooms and 3.5 bathrooms totaling 3,716 sq. ft. Although the house has been updated throughout, you can still spot several beautiful and timeless features of the original farm house. Just out the side door is an attached 2 vehicle carport. In between the barn and the house, there is a lighted half-court basketball court and a netted baseball batting cage. This area could be easily converted into a covered outdoor kitchen or living space. The metal barn is 1,840 sq. ft., with concrete slab and two, 920 sq. ft. overhangs. There are two draws on the property; both travel from northwest to southeast, and after leaving the property, they merge and head southeast into the Lavaca River. On the northern draw, the owners have built a .45 acre pond, which is able to capture much of the runoff from this property to maintain water levels. The other .3 acre pond sits just outside the back door and is within easy walking distance of the house. The ranch lies within the Gulf Coast Aquifer, one of the 9 major aquifers in Texas. The property consists of mostly improved pastures, which have been divided for rotational grazing and hay cutting. The draws are lined with mature timber such as pecans, elms, post oak, live oaks and hackberries. This ranch, along with the surrounding 4,287 acres was originally granted to Edwin Richeson on September 15th, 1832. The land was well-watered rolling prairie suited for pasture and cultivation of cotton and corn. Following the Civil War much of the land became small farms, and German immigrants began replacing the earlier Anglo-American residents. A community with a store operated by H. Barbade, a blacksmith shop, and a cotton gin grew near the center of Richesons grant and was named for George Witting, a large landowner (Carroll, 1).